Two sides of the Choornikkara village road in Kerala are lined with marigolds and a bushy variety of cowpea plants. 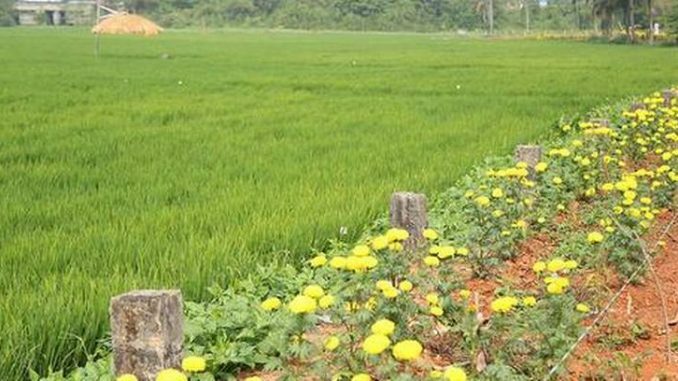 This area, around 15 km from Ernakulam just behind the Kochi Metro yard, is also resplendent with around 32 acres of green paddy fields ready for harvesting. This was not the case a couple of years ago. These fields were lying barren for over 15 years and the piece of land was an abandoned yard where villagers used to dump waste, including toilet waste and that collected from nearby butcher shops. There was a reason for this. In the 1990s a large number of people shifted from agriculture to other livelihoods, citing low level of profitability in farming. Choornikkara, which was also facing severe environmental degradation with the groundwater depleting and the ph level of water not suitable for potable purpose, witnessed a fall in number of farmers. As is evident, paddy is a vital part of the State’s environment and ecological systems and provides natural drainage paths for flood waters, conserves ground water, and preserves flora and fauna. In several regions of Kerala, paddy cultivation is carried out in a manner that enriches the specific geographical and ecological features of those regions. Years later, with some help from the government and some private groups, many people started going back to agriculture, especially rice cultivation. Choornikkara was also a part of that shift. But making the land cultivable was not an easy task. It was a massive exercise just removing the waste from the field. The members of the group worked day and night to make cultivation possible. “Those were sleepless nights,” recalls John Sherry, agriculture officer, Choornikkara panchayat. Sherry played an important role in making it a success. He assessed the quality of the soil and the structure of the land. He also advised the group on key issues and introduced them to Atma, a special project by Kerala State to promote farming. Theyreceived subsidy from the government under the project. The initial success gave them so much confidence that they thought about increasing the cultivation to the remaining 17 acres. This time, without any hesitation, people gave their lands to Adayalam. This time Sherry came up with another method called ecological engineering, a process that relies on use of cultural techniques to effect habitat manipulation and to enhance biological control. This is done by raising marigold plants at the border of the farm land, which helps attract natural enemies of pests and helps avoid the immigrating pest population. “Not many have explored this kind of a technique but I wanted to experiment with it here and it is a success,” says Sherry. Members of Adayalam and the agriculture officer have shown that a scientific approach towards farming can be profitable and can transform the environmental structure of an area. The water quality too has improved. What was once unusable water has become much better. According to the officials, the quality of water will further improve if they continue the project for a few more years. This time round, the whole village is joining hands to celebrate the success story. As part of the harvest, Adayalam organised a cultural festival called ‘Choornikkara Fest’, in which they showcased indigenous farming methods and hosted a cultural programme. Inspired by Choornikkara, more people in the nearby areas are planning to start farming projects. Apart from rice, the focus will also be on vegetable farming.